People aren’t always comfortable discussing the topic of mental health. But it is our job as a society to spread awareness about both positive mental health and mental health problems in our communities and world. During Mental Health Awareness Week (October 7-13), our Key Club honored the event through a special project. Mental Health Awareness Week is a worldwide movement to bring attention to mental health issues. It is held annually, and everyone can participate and spread the word about its importance. Each year, millions of Americans face the reality of living with a mental health condition. With small, progressive steps, we can help people who deal with these concerns on a day-to-day basis. Typically, teenagers are drawn to volunteer at kid-oriented events, such as elementary school fairs and book fairs. However, our club wanted to target a different audience: the older population. We decided to help the residents at our local Hillcrest Health & Rehab center by providing them with a simple mental health tool they might not have used before: stress balls. To make the stress balls, we used multicolored balloons, flour and funnels. Using a funnel, our members poured flour into each balloon until it was about the size of a small plum. We then tied our balloons, personalized them and added happy faces. After all the stress balls were made, they were transferred to Hillcrest Health & Rehab and given to the residents there. The coordinator stated they were extremely happy and grateful we were able to do this activity for them. We made around 25 stress balls in all. We were extremely proud of everyone who participated in this activity for the rehab residents and grateful we got to celebrate this week in honor of all of those who deal with a mental health condition. Next year and for years to come, we will continue to do a project in October to promote joy and happiness. 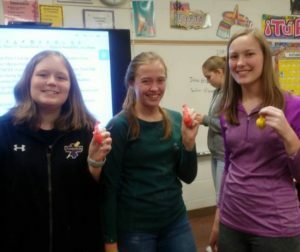 Members of the Bellevue West Key Club (L to R: Megan Joiner, Georgia Berg, and Caroline Berg with Alexis Hennings in the background) display the stress balls they made for Mental Health Awareness Week. 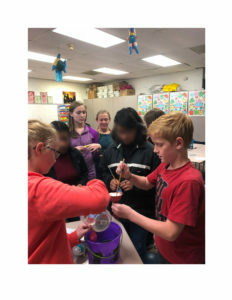 Members of the Belleview West Key Club (L-R: Autumn Hoffman, Caroline Berg, Georgia Berg, and Cooper Hoffman) fill balloons with flour to make stress ball during mental health awareness week.